Does anyone recognize this pattern? I really love this, and would like to try it, but am not advanced enough to be able to make my own pattern. Thanks. I'm sorry I can't help you, but you will be getting answers soon from those who do a lot of quilting. It sure is pretty. Very pretty design and fabrics. If you look at each component of the pattern it is really a very simple one. Main block looks sort of like a modified Ohio star. I bet it's not as hard as you think, go for it! You'll never know unless you try. Maybe Pam Bono? Have seen the quilt before in one of my magazines/books. Looks easy to make without a pattern. 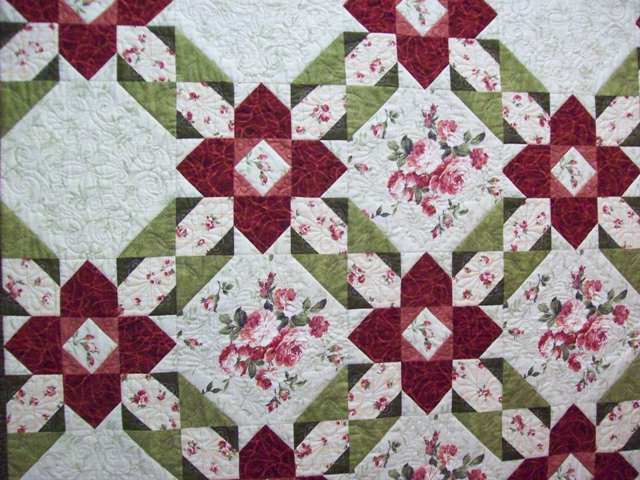 The roses are snowball type squares, the "star" is 9 patch with square in square in the middle, the corners have opposite corner triangles sewn on (can't remember the name of the technique, getting senile) and the middle outside has corner triangles sewn on opposite top edges. Just have to make sure that the triangles for the snowball are equivalent to the 9 patch square so that they are the same size when sewn next to each other, same with the corner triangles sewn within the 9 patch so that the white star points match up to the dark green corners. Hope I explained that correctly! Good luck, and will still look for pattern. My first thought was a Pam Bono quilt. I know I have seen that before though and I'm really leaning towards Pam for some reason. Last edited by Yarn or Fabric; 02-25-2012 at 02:12 PM. I had to chuckle when I saw the picture. I just copied that picture for my file sometime in the last day or so but they didn't give a pattern name. It's gorgeous! I'll be watching to see if anyone has an answer. well the green corners one is a snowball block. the other would be easy enough to make up without a pattern but would take some thinking of measurements. EQ help would be great if you want it. I saw a picture of this on the board yesterday and put it in my favorites. It is a beautiful quilt. I love the colors. Glad someone found the pattern. grab yourself a couple sheets of graph paper and a pencil---it really is an easy pattern--one block is a simple snowball block the other is a modified 9-patch with pretty simple components- you do not have to be very experienced to sketch it out on graph paper & make these 2 blocks- then put them together- just break it down= the graph paper makes it easy. I don't know what it is but it's sure a pretty design and beautiful colors. I'd love to make this for my mother-in-law's 90th birthday. I'll be watching for an answer too. I love this pattern, if you do do the pattern in eq, I would sure like to have it as well. beautiful! That is a gorgeous quilt. I would like to get that pattern too. It also look at the big blocks they are snowballs blocks.//with triangles and flying geese but I am sure there is an easier way than the way I am looking at it ,,But overall it beautifully put together! Most magazines still offer the older ones. you can usually check on their website for old issues easy to purchase. thanks to all of you for looking and your comments about this pattern. I don't get the McCall's quilting magazine, however my best friend might have it and she is going thru her collection today to see if she can find it. Now to show you how "green" I am about the quilting terms-----people have mentioned "EQ" and I don't know what that is. Can someone explain that to me? Also another forum member has offered to graph it out for me, and I responded to her and hopefully she is able to do that for me which is great. Everyone is so gracious on this board and very helpful and I appreciate it very much.